The Numerous Benefits of Deck Refinishing! A beautiful deck can help increase our outdoor living opportunities. Here in the Portland area, with the variety of weather conditions we are subject to, being able to enjoy the outdoors when the opportunity presents itself is crucial. However, our unique set of environmental conditions makes periodic deck refinishing (some combination of stripping, cleaning and staining) critical to keeping your deck in good condition. Another beautiful deck refinishing done by All Surface! Why Deck Refinishing is Needed. Long stretches of frequent rain followed by long stretches of intense UV exposure put both wood and synthetic decks to the test. If not maintained, the decking material will slowly start to deteriorate and take years off its potential life. A deck can require complete replacement in as few as 15 years if it is completely neglected and the damaging effects of the elements are allowed to take over. Additionally, our experience is that homeowners don’t use their decks as often if they are in poor condition. The aesthetic beauty of a clean and well maintained deck is hard to beat and beckons you to come outside and enjoy yourself. Barbecuing, entertaining, reading, sunbathing and dining are just a few of the great activities to enjoy on your deck. 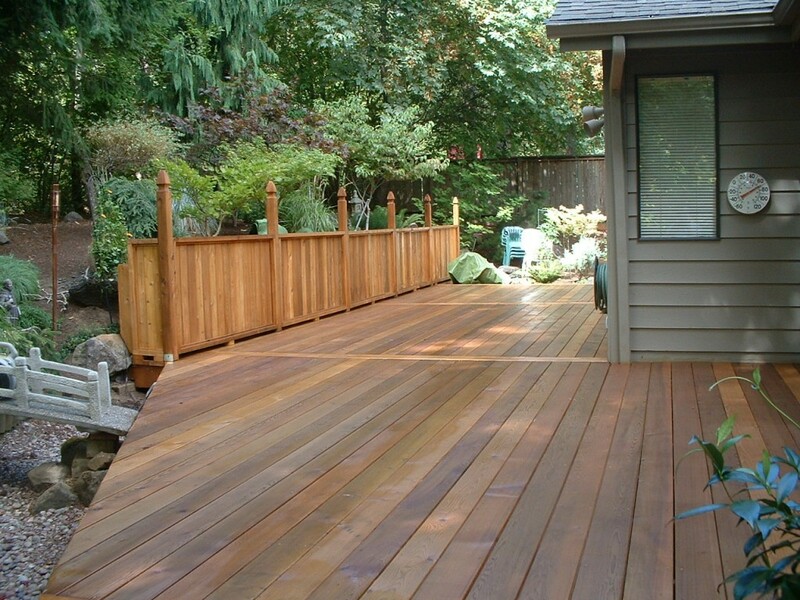 There are Quite of Few Stain Types Available to Use For Your Deck Refinishing. Starting with clear seals and moving through transparent, semi-transparent, semi-solid and finally solid stains, there are numerous choices. Here are samples of the transparent deck stain colors we offer. All Surface has determined the best brands for each of the different types of deck materials and its unique characteristics. Whether your deck is common softwood like cedar or fir, pretreated sunwood, an exotic hardwood or one of the various composite materials available, we can help you enhance and protect it. Good communication is critical to ensure that homeowner expectations are met. There are numerous processes that can be carried out to refinish a deck. Knowing what level of result the homeowner desires is the first step to providing satisfaction. Whether simply cleaning off a winter’s accumulation of mildew and slime, washing and reapplying a stain to refresh a deck, or completely bringing it back to bare wood and refinishing it, All Surface Cleaning Company can help you with your deck with our deck refinishing service. Oh, and if you have a fence, our business can help you with that too! Let’s talk today about what you want your deck refinishing to look like!